THOUSAND OAKS, Calif., Oct. 24, 2018 /PRNewswire/ -- Amgen (NASDAQ: AMGN) today announced that it is making Repatha® (evolocumab), an innovative biologic medicine for people with high cholesterol who are at risk for heart attacks and strokes, available at a reduced list price of $5,850 per year. This 60 percent reduction from the medicine's original list price will improve affordability by lowering patient copays, especially for Medicare patients. To view the Multimedia News Release, go to: https://www.multivu.com/players/English/8004559-amgen-repatha-reduced-list-price/. "Cardiovascular disease is one of the country's most significant health challenges, and every 40 seconds someone in America has a heart attack or stroke," said Robert A. Bradway, chairman and chief executive officer at Amgen. "Repatha can help to address this significant public health issue, but concerns over out-of-pocket costs have proven to be a barrier to its use for too many patients. We want to make sure that every patient who needs Repatha gets Repatha." Bradway noted that an estimated 75 percent of Medicare patients prescribed a PCSK9 inhibitor never actually fill their prescriptions, mainly due to high out-of-pocket costs. "Since turning 65 and going on Medicare I have had to make one of the hardest decisions of my life – can I afford to stay on Repatha, the only thing, even after nine stents and numerous statins, that has worked to lower my cholesterol?" says Repatha patient Bob C. from Boca Raton, Fl. "Given my family history of heart disease, today's announcement means that I can continue taking a therapy that has been so effective for me." Today's action reflects the Company's active participation in the American Heart Association's (AHA) Value in Healthcare Initiative. It also reflects Amgen's support for the goal of President Trump and his Administration to lower the price of drugs for U.S. consumers. In May of this year, the Company decided not to proceed with price increases on its medicines that had been planned for July. No price increases on any Amgen medicines have been taken since then or are planned for the balance of the year. Amgen is making Repatha available at a reduced list price by introducing new National Drug Codes (NDCs). SureClick®, the most commonly used delivery system, will be available immediately; the Pre-Filled Syringe and Pushtronex® (monthly, on-body infusor) delivery systems will be available in the next 2-3 months. The lower priced Repatha is identical to the Repatha currently available. "This is a unique solution for a unique situation," said Murdo Gordon, executive vice president of Global Commercial Operations at Amgen. Throughout 2018, Amgen has been offering payers significant rebates on Repatha in exchange for improved patient access through, for example, more simple utilization management criteria. The Company now has agreements in place with payers representing greater than 65 percent of Repatha's commercial revenue. "Unfortunately, higher rebates don't typically result in lower out-of-pocket costs for patients, especially for Medicare patients," Gordon said. "We are confident today's action will address this challenge." To allow for a smooth transition to these lower-priced options, Amgen will continue offering Repatha at its original list price for a period of time, with an expectation of discontinuing the original list price of Repatha by the end of 2020 or sooner. "While we hope more patients will benefit from swift adoption of these lower-priced options, it is ultimately a payer decision," Gordon said. 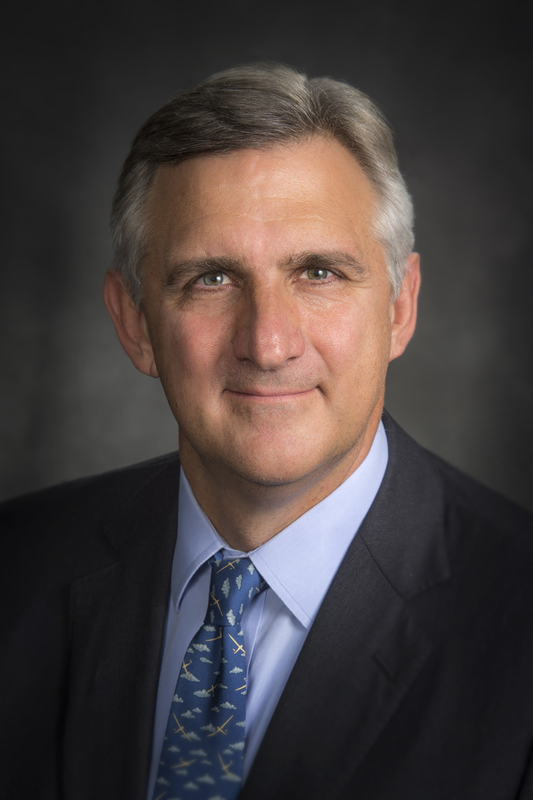 "At Express Scripts, our goal is to ensure affordability and ensure patients get the novel medicines they need," said Steve Miller, M.D., senior vice president and chief medical officer of Express Scripts. "With a new lower list price for Repatha, Amgen is taking an important step forward to help payers be better positioned to provide breakthrough medicines and help people achieve better outcomes." Patients or physicians who need help understanding these changes can contact RepathaReady® (1-844-REPATHA). The RepathaReady program provides a comprehensive suite of services to help patients and providers, including a Repatha $5 co-pay card for eligible commercially insured patients, insurance coverage support and injection training. Amgen also provides patient assistance for its medicines marketed in the U.S. in a variety of ways, including free medicines through the Amgen Safety Net Foundation for qualifying individuals with no or limited drug coverage. Elevated "bad cholesterol" or low-density lipoprotein cholesterol (LDL-C) is one of the most important modifiable risk factors for heart attack and stroke prevention. According to a recent Centers of Disease Control (CDC) report, 39 million adults could benefit from managing their cholesterol. Within this population, patients with established cardiovascular disease are at greatest risk for heart attack and stroke. Amgen will host a webcast call for the investment community on Wednesday, Oct. 24, 2018, at 2 p.m. PT / 5 p.m. ET. Murdo Gordon, executive vice president of Global Commercial Operations at Amgen, will participate. Live audio of the investor call will be simultaneously broadcast over the Internet and will be available to members of the news media, investors and the general public. The webcast, as with other selected presentations regarding developments in Amgen's business given by management at certain investor and medical conferences, can be found on Amgen's website, www.amgen.com, under Investors. Information regarding presentation times, webcast availability and webcast links are noted on Amgen's Investor Relations Events Calendar. The webcast will be archived and available for replay for at least 90 days after the event. Patients on Repatha experienced a reduction in the risk of heart attack (27 percent, nominal p<0.001), stroke (21 percent, nominal p=0.01) and coronary revascularization (22 percent, nominal p<0.001). Consistent with recent trials of more intensive LDL-C lowering, there was no observed effect on cardiovascular mortality. Similarly, there was no observed effect on hospitalization for unstable angina. FOURIER (Further Cardiovascular OUtcomes Research with PCSK9 Inhibition in Subjects with Elevated Risk), a multinational Phase 3 randomized, double-blind, placebo-controlled trial, is designed to evaluate whether treatment with Repatha in combination with statin therapy compared to placebo plus statin therapy reduces cardiovascular events. The primary endpoint is the time to cardiovascular death, myocardial infarction, stroke, hospitalization for unstable angina, or coronary revascularization. The key secondary endpoint is the time to cardiovascular death, myocardial infarction or stroke. Eligible patients with high cholesterol (LDL-C ≥70 mg/dL or non-high-density lipoprotein cholesterol [non-HDL-C] ≥100 mg/dL) and clinically evident atherosclerotic cardiovascular disease at more than 1,300 study locations around the world were randomized to receive Repatha subcutaneous 140 mg every two weeks or 420 mg monthly plus effective statin dose; or placebo subcutaneous every two weeks or monthly plus effective statin dose. Optimized statin therapy was defined as at least atorvastatin 20 mg or equivalent daily with a recommendation for at least atorvastatin 40 mg or equivalent daily where approved. The study was event-driven and continued until at least 1,630 patients experienced a key secondary endpoint. 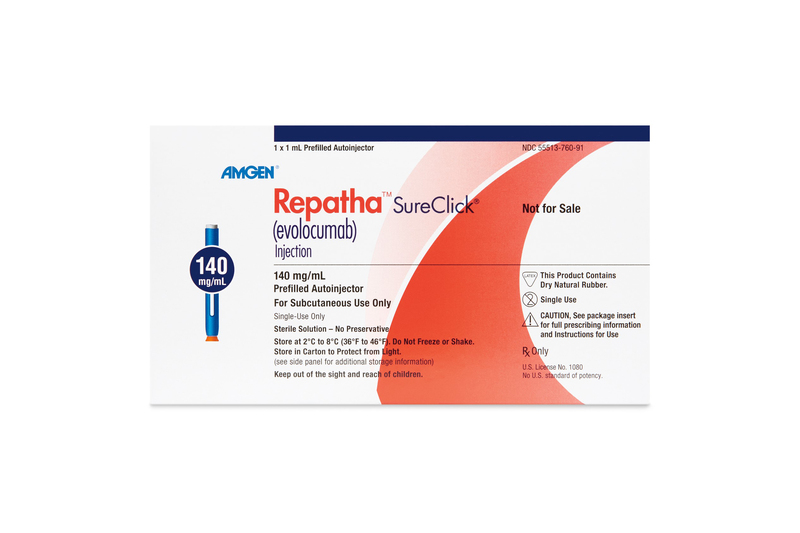 Repatha® (evolocumab) is a human monoclonal antibody that inhibits proprotein convertase subtilisin/kexin type 9 (PCSK9). Repatha binds to PCSK9 and inhibits circulating PCSK9 from binding to the low-density lipoprotein (LDL) receptor (LDLR), preventing PCSK9-mediated LDLR degradation and permitting LDLR to recycle back to the liver cell surface. By inhibiting the binding of PCSK9 to LDLR, Repatha increases the number of LDLRs available to clear LDL from the blood, thereby lowering LDL-C levels. Contraindication: Repatha® is contraindicated in patients with a history of a serious hypersensitivity reaction to Repatha®. Serious Hypersensitivity reactions including angioedema have occurred in patients treated with Repatha®. Allergic reactions: Hypersensitivity reactions (e.g. angioedema, rash, urticaria) have been reported in patients treated with Repatha®, including some that led to discontinuation of therapy. If signs or symptoms of serious allergic reactions occur, discontinue treatment with Repatha®, treat according to the standard of care, and monitor until signs and symptoms resolve. Adverse Reactions in Primary Hyperlipidemia (including HeFH): The most common adverse reactions (>5% of patients treated with Repatha® and occurring more frequently than placebo) in clinical trials were: nasopharyngitis, upper respiratory tract infection, influenza, back pain, and injection site reactions. From a pool of the 52-week trial and seven 12-week trials: Local injection site reactions occurred in 3.2% and 3.0% of Repatha®-treated and placebo-treated patients, respectively. The most common injection site reactions were erythema, pain, and bruising. Allergic reactions occurred in 5.1% and 4.7% of Repatha®-treated and placebo-treated patients, respectively. The most common allergic reactions were rash (1.0% versus 0.5% for Repatha® and placebo, respectively), eczema (0.4% versus 0.2%), erythema (0.4% versus 0.2%), and urticaria (0.4% versus 0.1%). Adverse Reactions in the Cardiovascular Outcomes Trial: The most common adverse reactions (>5% of patients treated with Repatha® and occurring more frequently than placebo) were: diabetes mellitus (8.8% Repatha®, 8.2% placebo), nasopharyngitis (7.8% Repatha®, 7.4% placebo), and upper respiratory tract infection (5.1% Repatha®, 4.8% placebo). 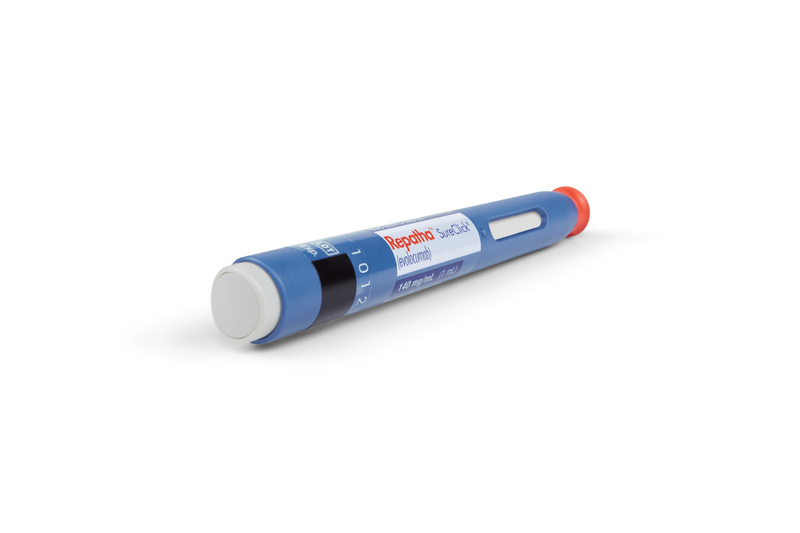 Among the 16,676 patients without diabetes mellitus at baseline, the incidence of new-onset diabetes mellitus during the trial was 8.1% in patients assigned to Repatha® compared with 7.7% in those assigned to placebo. Adverse Reactions in Homozygous Familial Hypercholesterolemia (HoFH): The adverse reactions that occurred in at least two patients treated with Repatha® and more frequently than placebo were: upper respiratory tract infection, influenza, gastroenteritis, and nasopharyngitis. Immunogenicity: Repatha® is a human monoclonal antibody. As with all therapeutic proteins, there is potential for immunogenicity with Repatha®. Building on more than three decades of experience in developing biotechnology medicines for patients with serious illnesses, Amgen is dedicated to addressing important scientific questions to advance care and improve the lives of patients with cardiovascular disease, the leading cause of morbidity and mortality worldwide. Amgen's research into cardiovascular disease, and potential treatment options, is part of a growing competency at Amgen that utilizes human genetics to identify and validate certain drug targets. Through its own research and development efforts, as well as partnerships, Amgen is building a robust cardiovascular portfolio consisting of several approved and investigational molecules in an effort to address a number of today's important unmet patient needs, such as high cholesterol and heart failure. This news release contains forward-looking statements that are based on the current expectations and beliefs of Amgen. All statements, other than statements of historical fact, are statements that could be deemed forward-looking statements, including estimates of revenues, operating margins, capital expenditures, cash, other financial metrics, expected legal, arbitration, political, regulatory or clinical results or practices, customer and prescriber patterns or practices, reimbursement activities and outcomes and other such estimates and results. Forward-looking statements involve significant risks and uncertainties, including those discussed below and more fully described in the Securities and Exchange Commission reports filed by Amgen, including our most recent annual report on Form 10-K and any subsequent periodic reports on Form 10-Q and current reports on Form 8-K. Unless otherwise noted, Amgen is providing this information as of the date of this news release and does not undertake any obligation to update any forward-looking statements contained in this document as a result of new information, future events or otherwise. No forward-looking statement can be guaranteed and actual results may differ materially from those we project. Discovery or identification of new product candidates or development of new indications for existing products cannot be guaranteed and movement from concept to product is uncertain; consequently, there can be no guarantee that any particular product candidate or development of a new indication for an existing product will be successful and become a commercial product. Further, preclinical results do not guarantee safe and effective performance of product candidates in humans. The complexity of the human body cannot be perfectly, or sometimes, even adequately modeled by computer or cell culture systems or animal models. The length of time that it takes for us to complete clinical trials and obtain regulatory approval for product marketing has in the past varied and we expect similar variability in the future. Even when clinical trials are successful, regulatory authorities may question the sufficiency for approval of the trial endpoints we have selected. We develop product candidates internally and through licensing collaborations, partnerships and joint ventures. Product candidates that are derived from relationships may be subject to disputes between the parties or may prove to be not as effective or as safe as we may have believed at the time of entering into such relationship. Also, we or others could identify safety, side effects or manufacturing problems with our products, including our devices, after they are on the market. Our results may be affected by our ability to successfully market both new and existing products domestically and internationally, clinical and regulatory developments involving current and future products, sales growth of recently launched products, competition from other products including biosimilars, difficulties or delays in manufacturing our products and global economic conditions. In addition, sales of our products are affected by pricing pressure, political and public scrutiny and reimbursement policies imposed by third-party payers, including governments, private insurance plans and managed care providers and may be affected by regulatory, clinical and guideline developments and domestic and international trends toward managed care and healthcare cost containment. Furthermore, our research, testing, pricing, marketing and other operations are subject to extensive regulation by domestic and foreign government regulatory authorities. Our business may be impacted by government investigations, litigation and product liability claims. In addition, our business may be impacted by the adoption of new tax legislation or exposure to additional tax liabilities. Further, while we routinely obtain patents for our products and technology, the protection offered by our patents and patent applications may be challenged, invalidated or circumvented by our competitors, or we may fail to prevail in present and future intellectual property litigation. We perform a substantial amount of our commercial manufacturing activities at a few key facilities, including in Puerto Rico, and also depend on third parties for a portion of our manufacturing activities, and limits on supply may constrain sales of certain of our current products and product candidate development. In addition, we compete with other companies with respect to many of our marketed products as well as for the discovery and development of new products. Further, some raw materials, medical devices and component parts for our products are supplied by sole third-party suppliers. Certain of our distributors, customers and payers have substantial purchasing leverage in their dealings with us. The discovery of significant problems with a product similar to one of our products that implicate an entire class of products could have a material adverse effect on sales of the affected products and on our business and results of operations. Our efforts to acquire other companies or products and to integrate the operations of companies we have acquired may not be successful. A breakdown, cyberattack or information security breach could compromise the confidentiality, integrity and availability of our systems and our data. Our stock price is volatile and may be affected by a number of events. Our business performance could affect or limit the ability of our Board of Directors to declare a dividend or our ability to pay a dividend or repurchase our common stock. We may not be able to access the capital and credit markets on terms that are favorable to us, or at all.